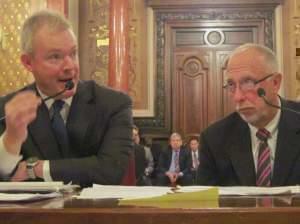 The Illinois Senate has approved the final piece of a new state budget. The spending plan approved Friday now goes to Gov. Pat Quinn. The sponsor of a bill that would have added five new casinos in Illinois, including one in Danville, won't be calling the bill. That essentially kills gambling expansion for now. The Illinois Legislature has approved a gun measure that would end the last statewide ban in the nation on the concealed possession of a firearm in public. A plan to limit high-capacity ammunition magazines in Illinois has failed in the Senate. Senators voted 28-31 Friday. A federal agency has denied Indiana's appeal of an administrative ruling barring the state from denying Planned Parenthood Medicaid funds because it performs abortions. Jordan Parr hit two home runs to lead Illinois to a 6-4 win over Georgia Tech in an NCAA regional Friday. A lawsuit over health care in prisons in Illinois is getting a boost from the American Civil Liberties Union. Sentencing will be July 19 for a man convicted of killing five members of his ex-wife's family with a tire iron in a small Logan County town. State Representative Adam Brown says he expects the Senate and Governor to quickly approve a measure backing a number of economic projects, including a fertilizer plant in Tuscola.